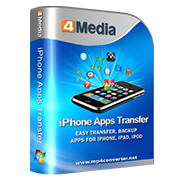 4Media iPhone Apps Transfer offers the perfect iPhone app transferring and managing solution, which helps you copy apps to PC or iTunes, transfer apps back to iPhone, add, save and delete app documents easily. Download the free trial and try it now! Copy the iPhone apps to computer or iTunes in few clicks. Transfer apps from PC to iPhone, delete the app directly within this software. With 4Media iPhone Apps Transfer, you can add the document for iPhone apps, copy document to computer, or delete document from your iPhone directly. Transfer iPhone apps in batch, you can transfer apps as many as you want. Transfer iPhone apps by dragging and dropping, this improves the efficiency significantly. All the apps will be showed up automatically as long as the iPhone is connected to computer. With the app search box in 4Media iPhone Apps Transfer, you just need to input app name to locate the app(s). Name, Modified time and Size of the documents will be showed up when you choose an app. Languages in English, German, French, Spanish, Italian, Simplified Chinese, Traditional Chinese and Japanese are available for the interface.